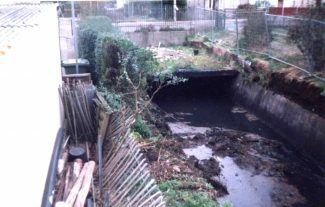 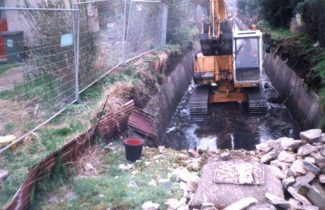 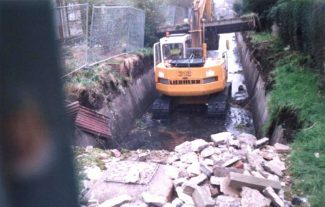 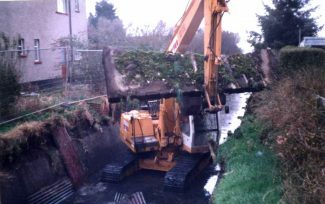 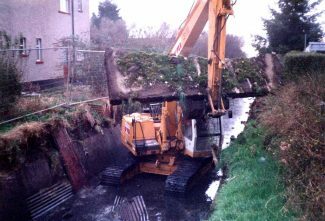 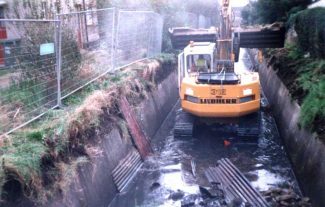 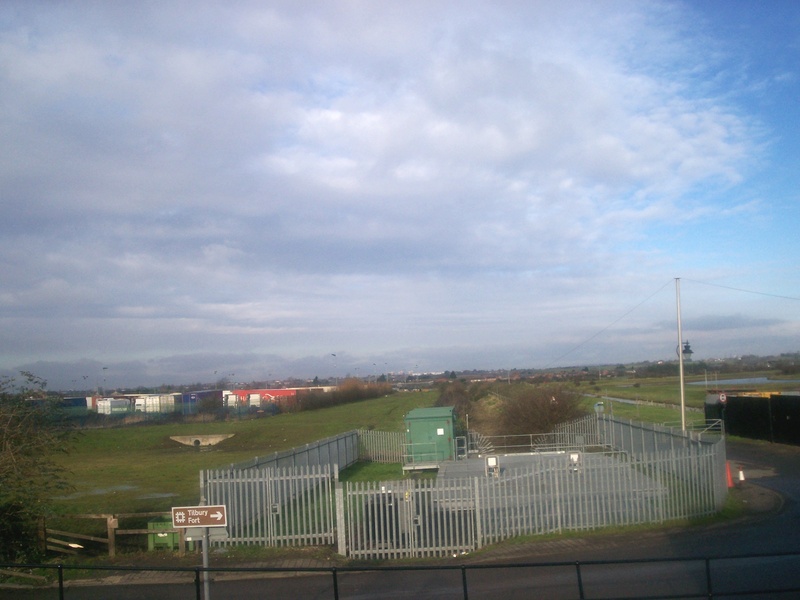 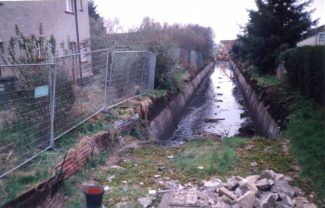 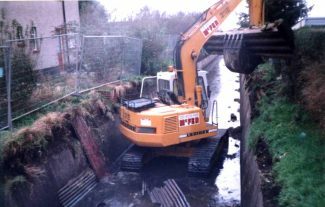 A STORM DRAIN, OR SEWER SYSTEM, IS DESIGNED TO DRAIN THE STORM WATER FROM THE EARTH OR SOIL UNTREATED FROM SURROUNDING HOUSING ESTATES ETC, AND THEN INTO A RIVER DIVERSION WHICH IS THEN PUMPED INTO A RIVER – IN THIS CASE THE RIVER THAMES. 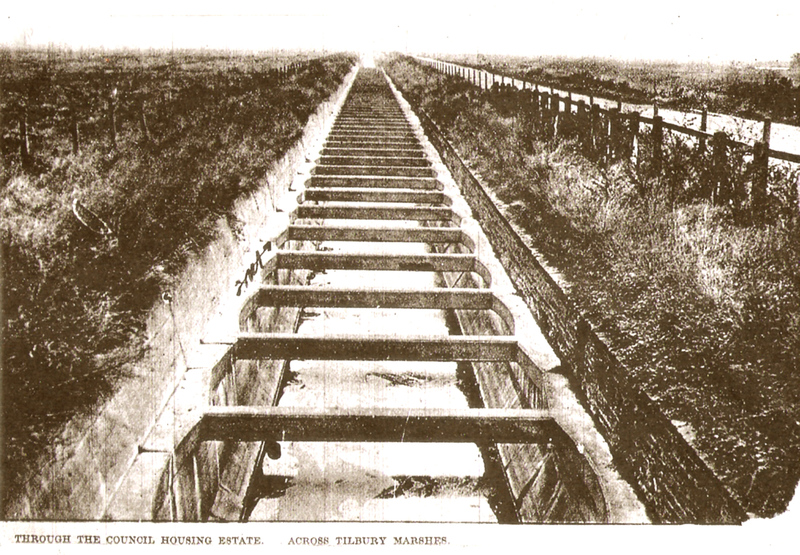 HERE WE HAVE AN OLD PHOTO OF THE STORM DRAINS IN FEENAN HIGHWAY, AROUND 1920-1930 OPEN AND UNCOVERED. 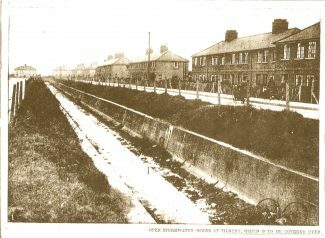 IN THE EARLY 1940s . 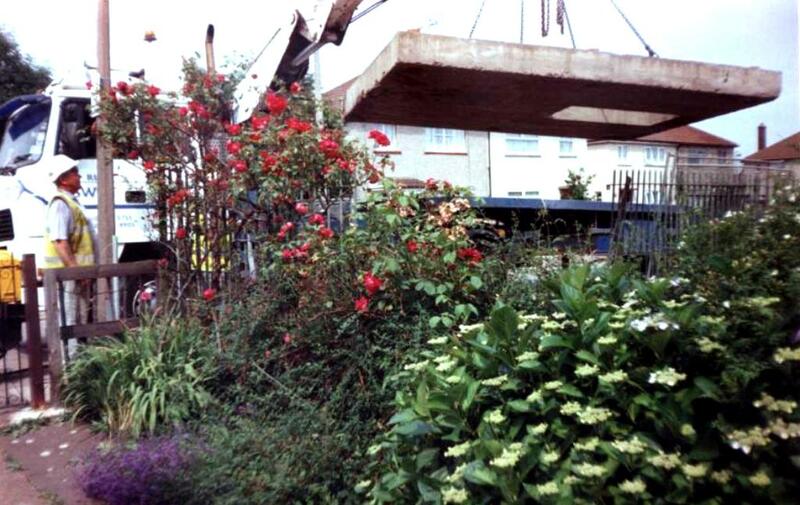 THEY WERE COVERED WITH LARGE CONCRETE SLABS FOR SAFETY AND HEALTH REASONS. 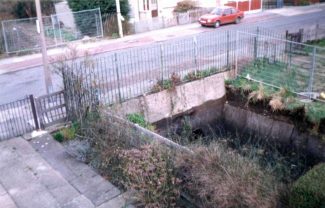 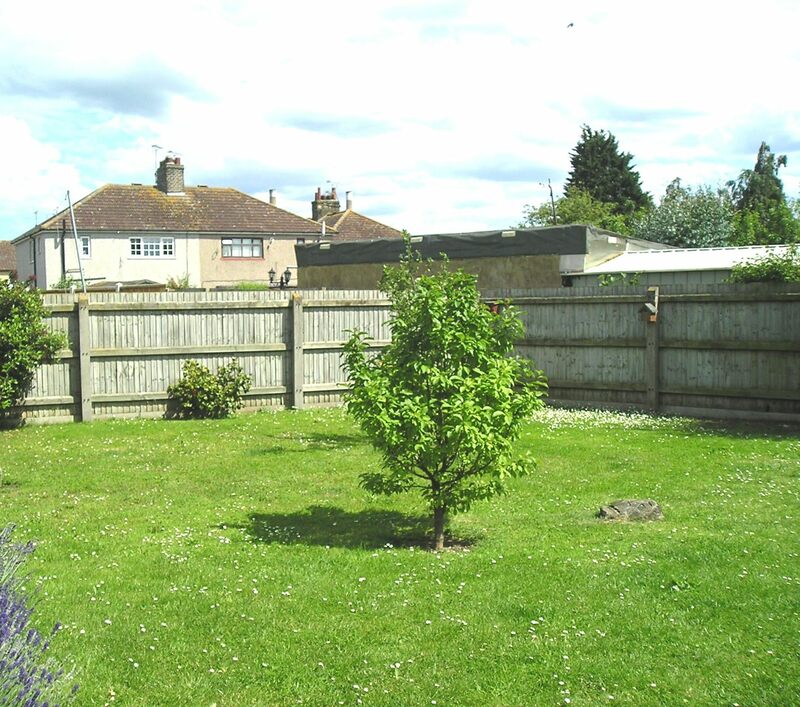 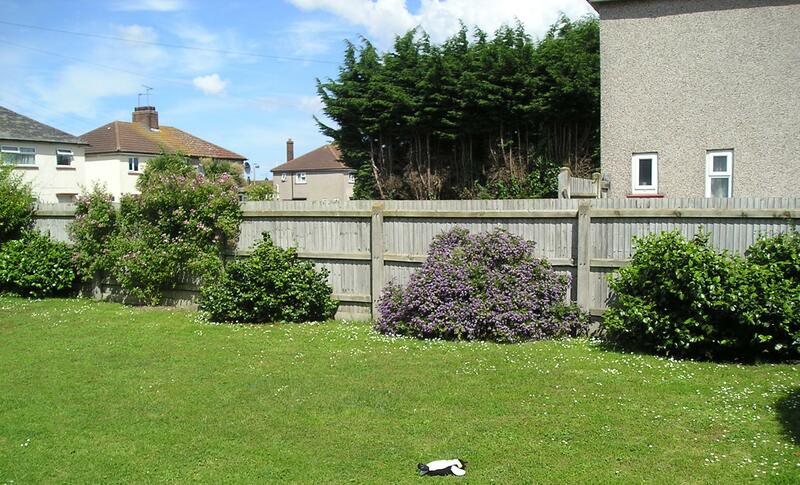 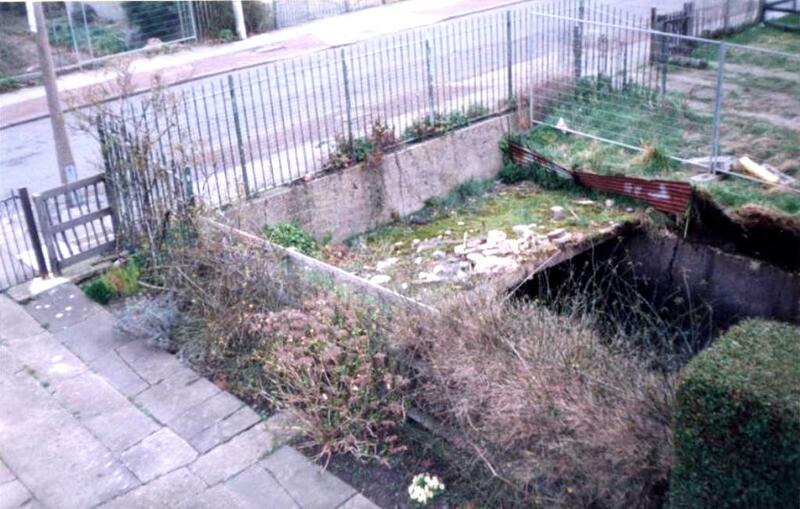 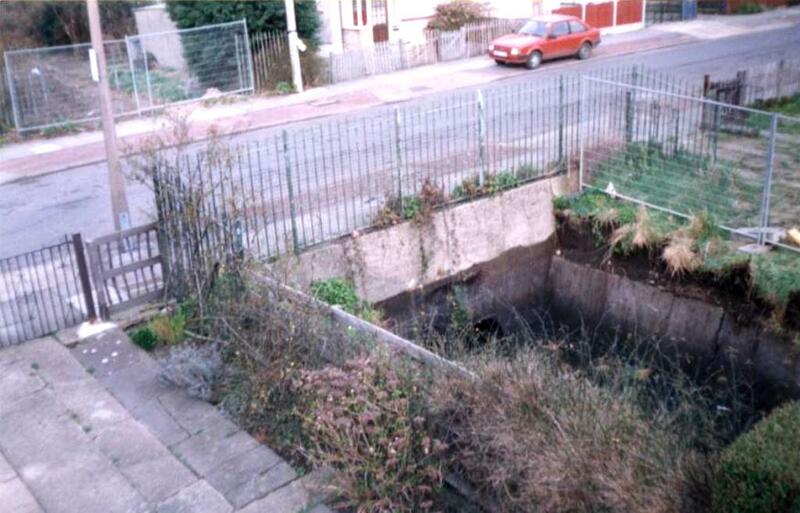 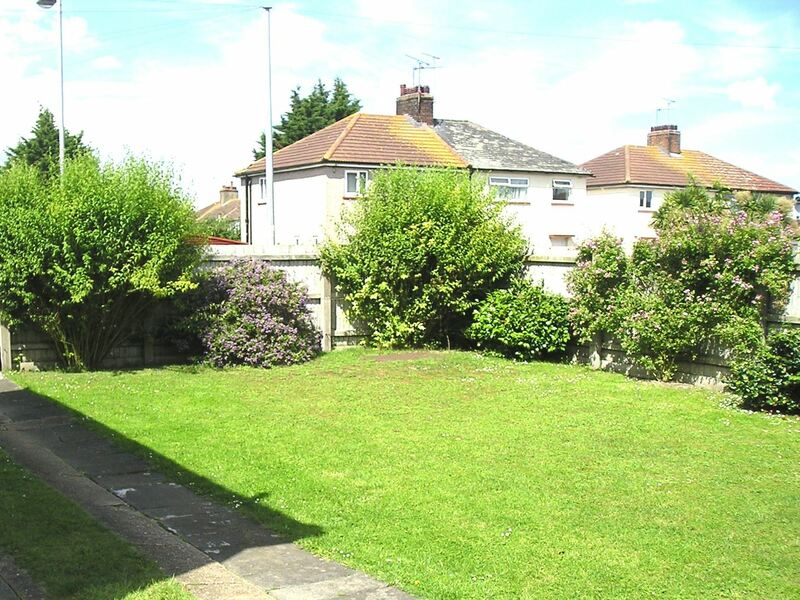 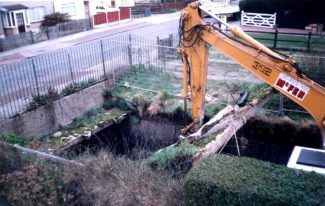 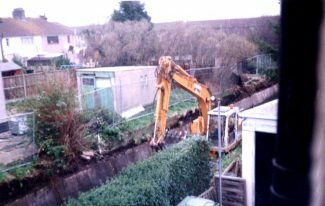 IN THE YEAR 2000 THE STORM DRAINS WERE UPGRADED AGAIN, WITH STORM PIPES ADDED ,IN THE GULLIES , ALL OVER TILBURY.AND THOSE WHICH RUN ALONGSIDE THE HOUSES OF TILBURY WERE BACK-FILLED WITH EARTH, AND ADDED AS GARDENS. 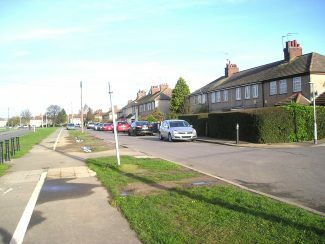 In the pictures below, we see how they looked in the1930s, and how they look today covered with footpaths. 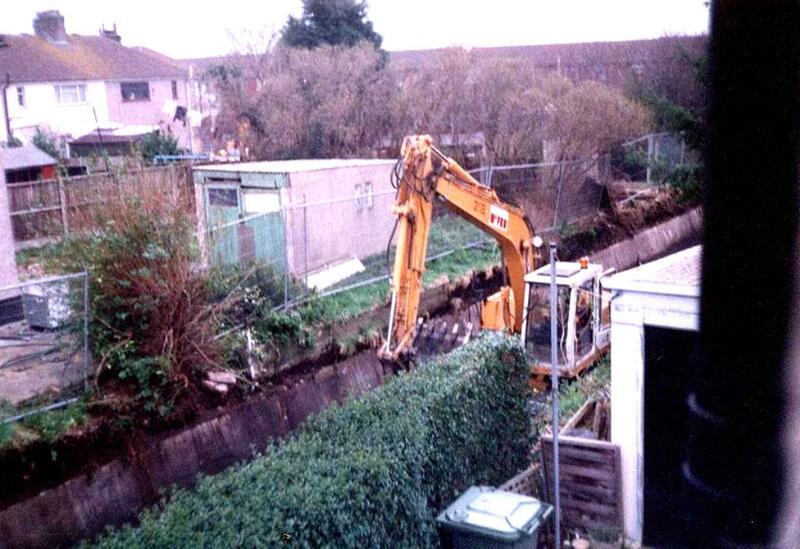 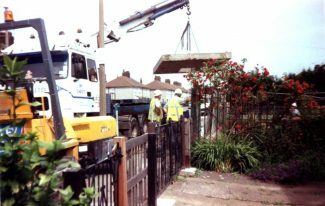 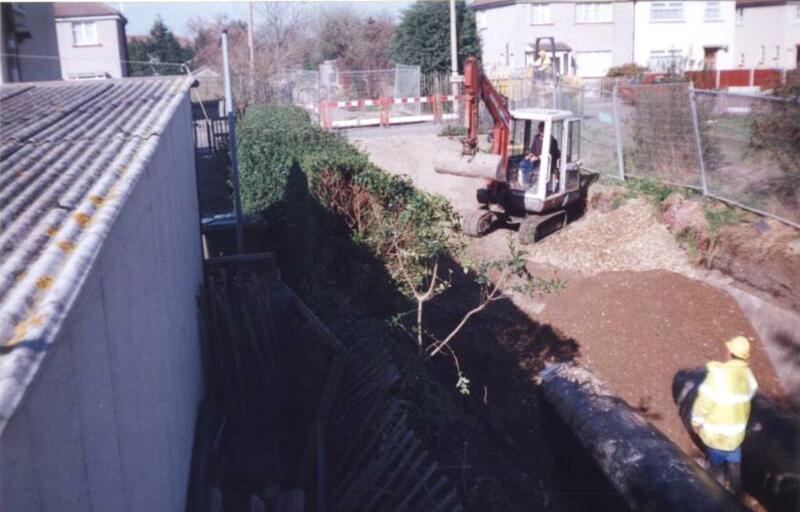 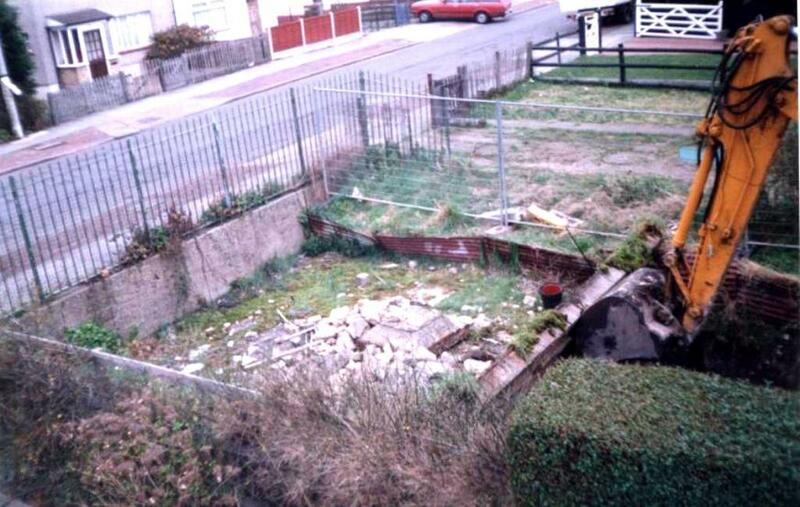 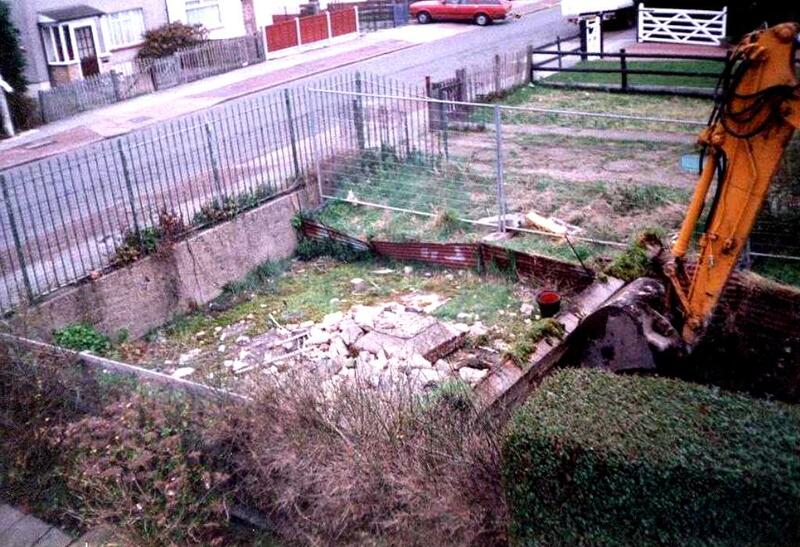 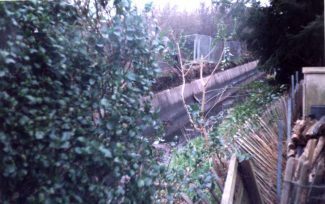 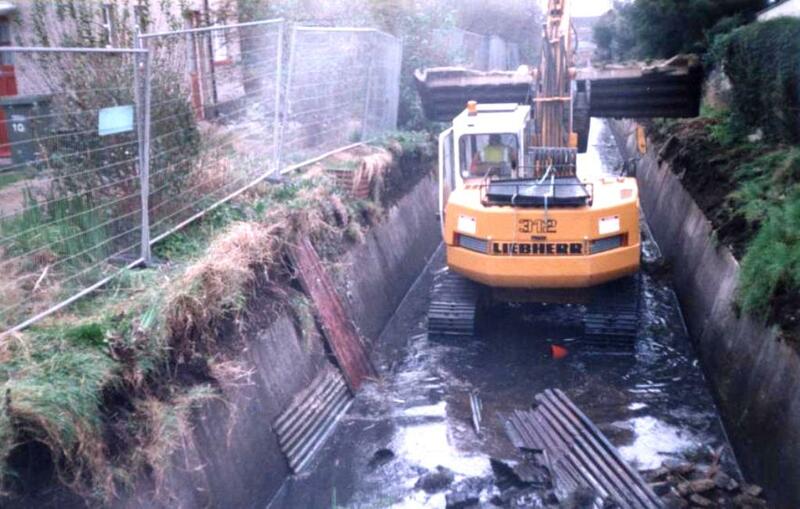 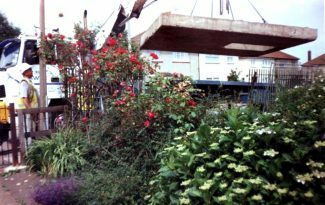 There are also photos of work being carried out in the year 2000, next to houses in Tilbury. 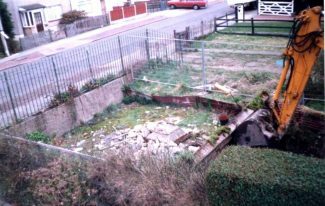 Nice article and pictures John. Was always aware of the River Diversion down to the Worlds End, and knew that it run through sections of Tilbury – you could see big sections of it where it was concreted over, but wasn’t aware that it was open for a long period of time.